April was first declared Child Abuse Prevention Month by presidential proclamation in 1983. Since then, April has been a time to acknowledge the importance of families and communities working together to prevent child abuse. The Northern Kentucky Children’s Advocacy Center is a critical link that provides assistance, information, services, and support for children and families through a team approach for child abuse investigation and treatment. The center provides a safe, non-threatening, relaxed atmosphere, which helps to ease the child victim's and family’s anxieties and fears. A trained forensic interviewer talks with children in a child-friendly environment. Specially trained pediatricians provide the comprehensive child sexual abuse medical examinations at the center and are able to testify on the child’s behalf. Trained professionals provide crisis counseling, advocacy, and support. The NKYCAC staff works closely with social services, law enforcement, mental health, and prosecutors stressing coordination with the ultimate goal of ensuring that children are protected, safe and not re-victimized. 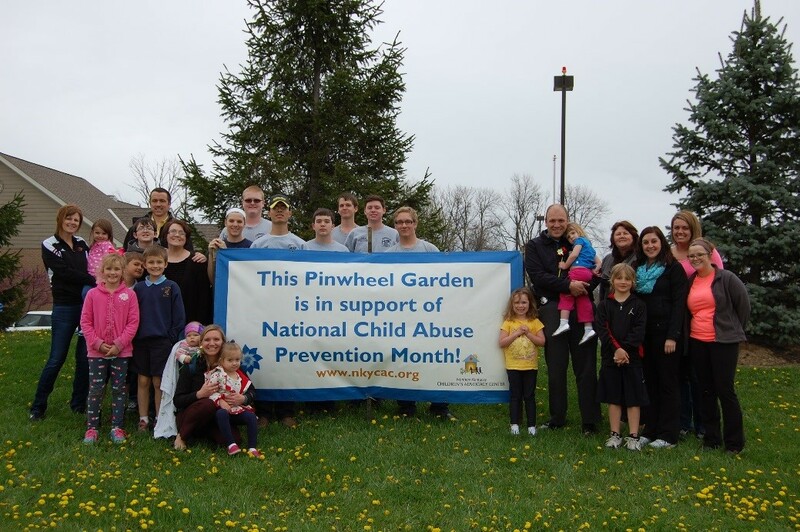 FLORENCE, Ky. – NKYCAC and Chuy’s Mexican Food will be “Planting Pinwheels” to honor the children in Northern Kentucky. The pinwheel symbol is used to raise awareness about child abuse and neglect prevention. It was chosen to represent hope and promise, believing every child deserves to be raised in a healthy, safe and nurturing environment. It is our hope this image can positively help impact the way the public views both children, as well as the prevention of child abuse and neglect. Chuy’s Mexican Food on Houston Road, will serve a special “thank you” luncheon to local law enforcement officials, social workers, prosecutors and victim advocates, volunteers and community partners thanking them for the hard work and dedication they provide to the children in the Northern Kentucky community. The luncheon will be held at the Northern Kentucky Children’s Advocacy Center. “It is critical that every adult in Northern Kentucky knows that child abuse occurs every day in every community and that it is our responsibility to ensure every child is safe and to report to the law enforcement and social services when you believe a child is being harmed”, said Randy Rawe Chairperson of the Northern Kentucky Children’s Advocacy Center. The Northern Kentucky Children’s Advocacy Center is a nonprofit organization that provides services to children who have been sexually abused, severely physically abused and who have witnessed violent crimes. In addition, the NKYCAC provides supportive services for non-offending parents, caregivers, siblings, family members and professionals. Its multidisciplinary team includes social workers, law enforcement, prosecutors, therapists, advocates and health care providers. The NKYCAC is a child-focused, welcoming environment that ensures that children are protected and that children and the non-offending adults, who care for them, can begin to heal. As the designated regional children’s advocacy center, we serve Boone, Campbell, Carroll, Gallatin, Grant, Kenton, Owen and Pendleton counties. Founded in 1982 in Austin, Texas, Chuy's serves authentic and affordable Mexican fare in an atmosphere full of fun and attitude. The menu offers family recipes from south Texas, New Mexico and Mexican border towns, all made to order from fresh ingredients. Chuy's has the reputation across Texas and the Southeast as the most fun and friendly spot to eat real Mexican food at a great price. 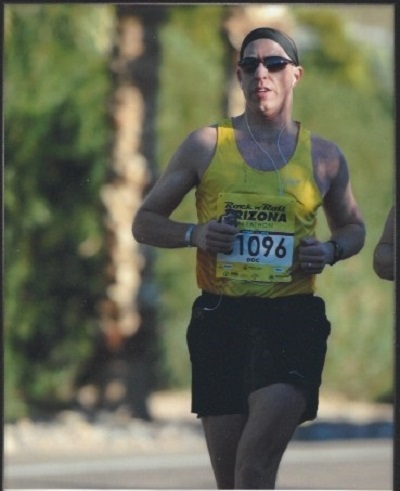 Thanks to everyone who sponsored Robert Tagher, MD of Pediatrics of Florence for his participation in a 100-mile race in the Florida Keys! He and his crew broadcasted live on May 20th on Facebook. It was great to watch the race and be kept up to date! 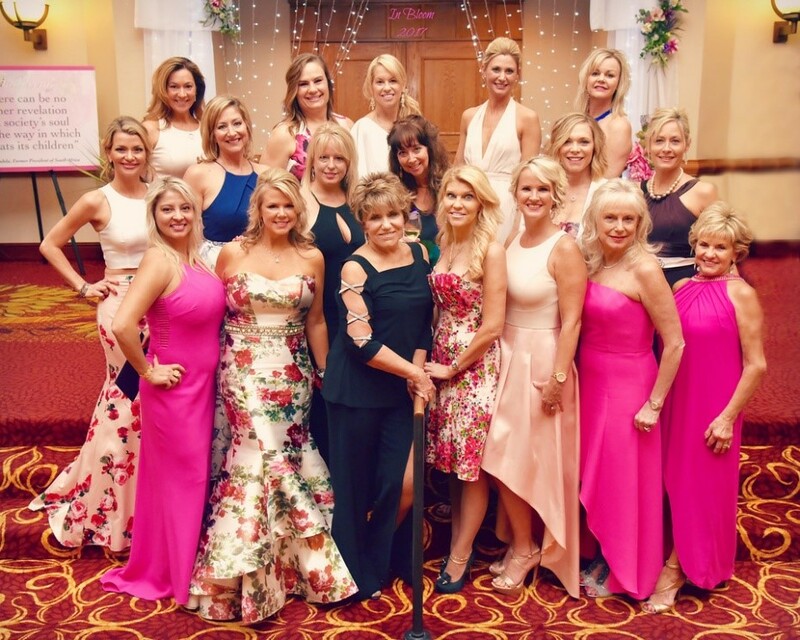 The Guests were Glamorous and Their Giving was in "Full Bloom"
The illustrious guests of The Advocates Annual Grand Gala, “In Bloom!” 2017 made this year’s event a triumphant success raising over $102,000.00! It was a night of floral fantasy, where the guests were glamorous and their giving was in “full bloom”. One of the highlights of the evening was a mother who shared the story of her families’ journey at NKYCAC, the room was left silent and their journey will not soon be forgotten by those who attended. Northern Kentucky Children’s Advocacy Center facilitates a community response to sexual and physical abuse by coordinating the investigation, conducting forensic interviews, providing medical treatment, offering trauma-informed counseling, and offering educational classes to the public. “NKYCAC is one the best resources in our community to keep children safe, help them to heal, and to end the cycle of abuse,” said Diane Kidd and Advocate for NKYCAC. Proceeds from “In Bloom” will fund the essential services of NKYCAC. The NKYCAC is the only Children’s Advocacy Center in Northern Kentucky. The tri-chairs for “In Bloom” 2017, Cynthia Browning, Tara Lucas, and Patti Lally believe that adults are responsible for the safety of children and are extremely grateful that so many supporters attended the gala and have chosen to support the work of NKYCAC. Northern Kentucky Children’s Advocacy Center serves over 800 children a year in Northern Kentucky. The mission of the Northern Kentucky Children’s Advocacy Center is to keep children safe from abuse, and when abuse occurs, to work with our community to bring healing to these children and their families. To learn more about the Northern Kentucky Children’s Advocacy Center please visit our website at www.nkycac.org, or to make a donation please call (859)442-3200. The Northern Kentucky Children's Advocacy Center provides a coordinated response to concerns of child abuse in a child-focused environment, offering prevention, evaluation, and treatment to children and families. The center provides services to children who have been sexually abused, physically abused and children who have witnessed violent crimes. NKYCAC ensures that children are protected and their non-offending caregivers have support so both can begin to heal. For more information about Northern Kentucky Children’s Advocacy Center and how you can donate or be a part of this mission please visit our website, www.nkycac.org. THE ADVOCATES ANNUAL GRAND GALA, “IN BLOOM!” 2017 WAS A TREMENDOUS SUCCESS! Thank you to all of those who attended and/or helped with The Advocates Annual Grand Gala, "In Bloom!" 2017! We hope that you were able to attend and had a fabulous night. For those unable to attend, we hope you get to our Gala in 2018! Thank you all for being NKYCAC's friend, and here's to blossoming friendships! With proceeds from the Gala, we can continue out fight against child abuse and help children have safe and secure childhoods. Special recognition must go to the Gala's sponsors listed below. They are essential in helping NKYCAC with its mission to help children. Please patronize these amazing sponsors below! Please patronize these companies. They have Helped Us Help the Children of Abuse in Northern Kentucky! Thank you for your support of the "In Bloom!" 2017 Gala! 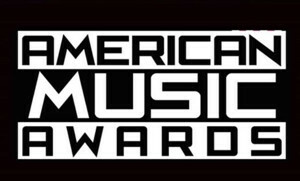 It was a tremendous success! Proceeds from The Advocates Annual Grand Gala "In Bloom!" will fund the essential services of the NKYCAC, the only Children's Advocacy Center in Northern Kentucky. The NKYCAC serves children and families of Boone, Campbell, Carroll, Gallatin, Grant, Kenton, Owen, and Pendleton counties. The Grand Raffle and The Bourbon & Bubbles Raffle WINNERS! The winning tickets were drawn at The Advocates Annual Grand Gala, “In Bloom!” 2017 on March 4th! Proceeds from the Grand Raffle and the Bourbon & Bubbles Raffle will fund the essential services of the NKYCAC, an Accredited Children’s Advocacy Center where children’s needs are always the first priority. Details about the prizes for these raffles are below. 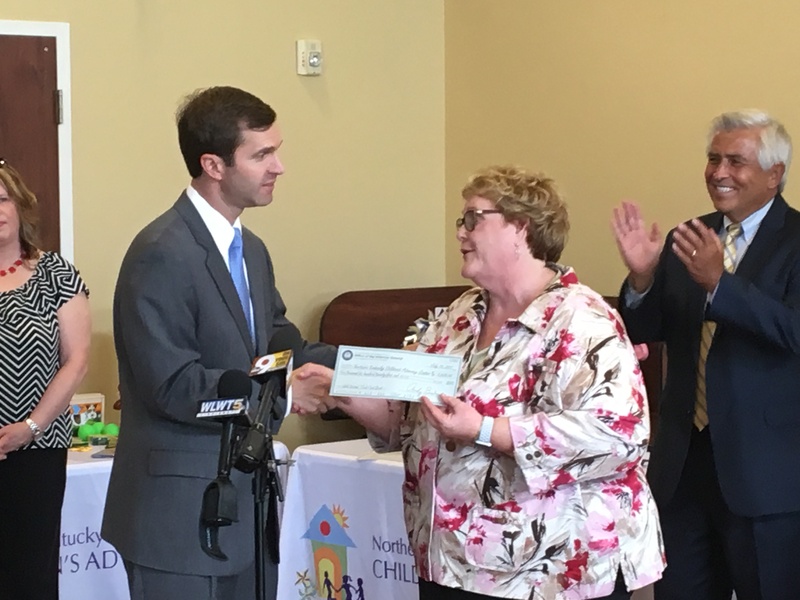 On July 10, 2017, Attorney General Andy Beshear visited the Northern Kentucky Children's Advocacy Center (NKYCAC) to present the center with a grant for providing case management services for child sexual abuse medical examinations. The $5,625.00 will provide funding for medical examinations for child victims of sexual abuse. By providing this funding to the center, children will be able to undergo these difficult examinations in a safe, child-friendly environment at the center as opposed to being seen in a hospital emergency room. AG Beshear spoke of his dedication to bringing caring treatment and justice to these victims, as well as the need to prevent child abuse. He thanked the law enforcement personnel present, as well as the center staff and Executive Director, Vickie Henderson. The center provides a multidisciplinary approach to the investigation of child abuse by working with law enforcement, prosecutors and case workers, and provides specially trained interviewers and advocates. Dr. Rob Tagher Day was June 13, 2017 in the City of Florence, KY! On May 20th, Dr. Robert Tagher, a pediatrician at Pediatrics of Florence, ran the Keys 100 Ultramarathon, a 100-mile long race from Key Largo to Key West, and he donated all proceeds to the Northern Kentucky Children's Advocacy Center. Not only did Dr. Rob finish the race with a time of 18:35:11, more than 1 hour less than the ultramarathon he completed in 2013, but he was the winner of the Master's Division and placed 7th overall! He also raised more than $12,000 for NKYCAC! We are so excited and grateful for Dr. Rob's commitment and dedication to the children and families of Northern Kentucky and his support of NKYCAC. 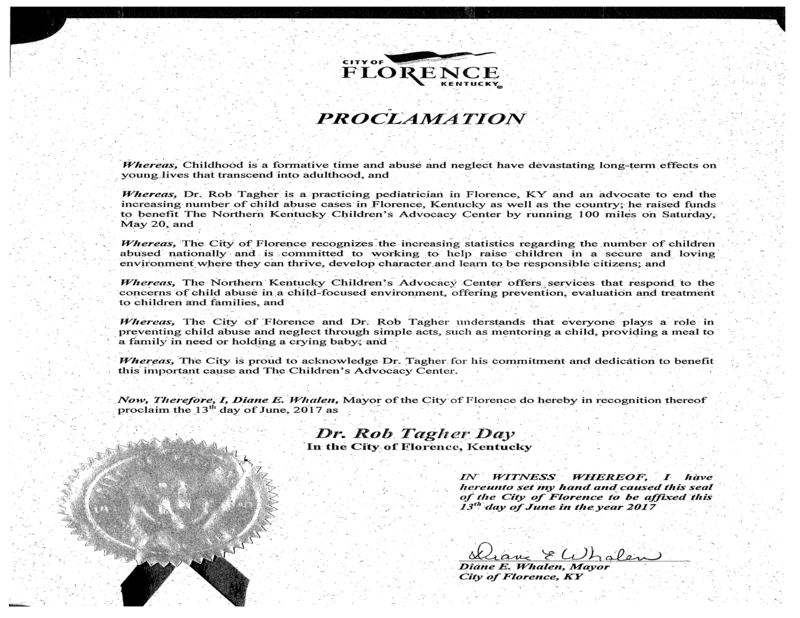 On June 13th, Diane Whalen, the Mayor of the City of Florence, KY proclaimed the day to be Dr. Rob Tagher Day recognizing Dr. Rob's commitment and dedication. The Proclamation of Dr. Rob Tagher Day!